Vail Resorts, Inc. (NYSE: MTN) today announced an epic partnership with one of the snowiest and most celebrated powder skiing resorts in the world—Niseko, Japan. The partnership represents the first Asian partner for the company, further enhancing the already incredible value of its flagship and industry-changing season pass. Epic Season Passholders have the opportunity to experience unlimited and unrestricted skiing and riding at the best of the USA, including Vail, Beaver Creek, Breckenridge, Keystone and Arapahoe Basin in Colorado; Canyons in Park City, Utah; Heavenly, Northstar and Kirkwood in Lake Tahoe; and now five complimentary consecutive days at Niseko, Japan, for the 2014-2015 winter season. In less than a week of skiing and riding, the Epic Pass pays for itself and continues to offer the best value in the snow sports industry, with access to 28,830 skiable acres and 27,136 vertical feet at the best ski and snowboard resorts in the U.S., as well as complimentary access to mountains across multiple continents. In 2008, Forbes crowned Niseko one of the Top 10 International Ski Resorts, and more recently, National Geographic voted Niseko as the best powder snow resort in the world. It’s no wonder, given that the resort boasts an average jaw-dropping 590 inches (15m) of snow per year. Located 100 kilometers south of Japan’s fifth largest city, Sapporo, in the southwest corner of the northern Japanese island of Hokkaido, Niseko Annupuri is a part of the Niseko-Shakotan-Otaru Kaigan Quasi-National Park and is the most eastern park of the Niseko Volcanic Group. Seasonal winds from the Eurasian continent blow in some of the driest, lightest and plentiful snow in the world. Set against the backdrop of Mt. Yotei—an active volcano similar to Mt. Fuji—the Niseko region boasts not only epic skiing and riding, but also breathtaking scenery. At night, the mountain is lit up with stadium-style lights which brighten 2,560 vertical feet of skiing and riding. Deep-powder trails through lit birch trees are a Niseko staple, offering sheltered stashes of untouched powder skiing. Niseko United, as it’s commonly referred to, is made up of four base areas—Annupurri, Grand Hirafu, Niseko Village and Hanazono—that access one mountain, Niseko Annupuri (4,291 feet). With wide open trails, incredible tree runs, epic backcountry, first tracks and night-skiing, Niseko caters to all abilities, from beginner to expert. For the adventurers, hiking trails lead from the highest lifts to the summit. An extensive lift system of 26 chairlifts and three gondolas accesses 72 trails. Aside from world-class skiing, the Niseko area is known for its premium agriculture and locally brewed alcohol. Local restaurants import fresh seafood from nearby towns and villages and the area is home to a vast array of restaurants and bars with everything from authentic Japanese fare to European cuisine. Being a volcanic island, Hokkaido is also well-known for its thousands of natural hot springs, or ‘onsen’. 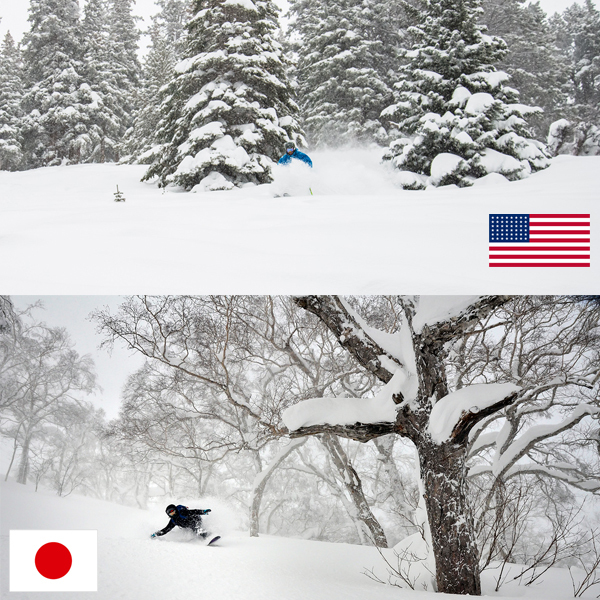 With non-stop flights between Tokyo’s Narita International airport and several major US cities, including Los Angeles, San Francisco, Denver and New York, it’s never been easier for U.S. skiers and riders to visit Niseko.Nisekois typically open from November through May. The five free consecutive days of skiing and riding will be reciprocated for Niseko All-Mountain Season Pass holders, allowing more guests from Japan, China and surrounding areas to experience Vail Resorts’ world-class mountain resorts. The Epic Season Pass will be available for purchase on March 10, 2014, at www.epicpass.com. The Epic Local Pass™is perfect for guests who can navigate a pass with a few more restrictions on their winter vacation. The Epic Local Pass offers unlimited and unrestricted skiing or riding at Breckenridge, Keystone, Afton Alps, Mt. Brighton and Arapahoe Basin, with limited restrictions at Canyons, Heavenly, Northstar and Kirkwood. Also includes a total of 10 days at Vail and Beaver Creek with U.S. holiday restrictions. At the spring rate, the Epic Local Pass pays for itself in just over four days. The Epic 7-Day ™ is ideal for guests who only plan to ski seven days throughout the winter season. It features seven unrestricted days of skiing and riding at Vail, Beaver Creek, Breckenridge, Keystone and Arapahoe Basin in Colorado; Canyons in Park City, Utah; Heavenly, Northstar and Kirkwood in Tahoe, Mt. Brighton and Afton Alps. For more information, visit http://www.epicpass.com. Passes will be available for purchase beginning March 10, 2014.